The popularity of the ‘Angry Birds’ franchise has been revolutionary; with Rovio spinning off its game beyond the touch screen mobile phone devices into plush toys, t-shirts, clothing, radios, etc. in the process making absolutely millions along the way. Which is all great, but there is one game that I cannot get off my mind, that seems absolutely prime for a reboot and re-launch. I believe it would work great on touch screens and would almost certainly sell just as much as the bird flinging game. The game I speak of – Lemmings! 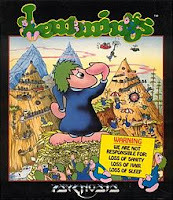 For the uninitiated, Lemmings was first released back in 1991 as a puzzle game – the objective of which was to guide and save as many suicidal lemmings as possible to their safe haven. You do this by assigning some of those little guys a job – say to dig a hole or block a pathway or build a bridge. Save enough of the little blighters and you progress to the next level. The simplicity of the game and addictiveness of the challenge of saving the little rodents is what makes this an absolutely timeless classic and one that deserves to be brought back for the modern mobile phone playing gamer. I’m convinced that if brought back in its original format (no one wants to see “Lemmings 3D”), it would be a huge success and a genuine challenger to those Angry, Angry Birds.